Scientific Discourse in Sociohistorical Context represents the intersection of knowledge and method, examined from the perspective of three distinct disciplines: linguistics, rhetoric-composition, and history. Herein, Dwight Atkinson describes the written language and rhetoric of the Royal Society of London, based on his analysis of its affiliated journal, The Philosophical Transactions, starting with the 17th century advent of modern empirical science through to the present day. Atkinson adopts two independent approaches to the analysis of written discourse--from the fields of linguistics and rhetoric-composition--and then integrates and interprets his findings in light of the history of the Royal Society and British science. Atkinson's study provides the most complete and particular institutional account of a scientific journal, which in this case is a publication that stands as an icon of scientific publication. He supplies his readers with important material found nowhere else in the historical literature, including details about the operation of the journal and its relation to the society. The work embeds the history of the journal and its editors within the history of the Royal Society and other developments in science and society. The synthesis of historical, linguistic, rhetorical, and cultural analysis makes visible certain complex communicative dynamics that could not previously be seen from a single vantage point. The work presented here reinforces how deep historical examinations of linguistic and rhetorical practices have direct bearing on how and what scholars read and write now. Most significantly, this volume demonstrates how these historical activities need to inform current teaching of and thinking about language. "As far as I know, no other analysis attempts to take on such a range of texts in such detail, while maintaining a sense of the historical context in the interpretation of the statistics….Atkinson's main contribution is not any particular claim about scientific discouse or the history of science, but rather the rigor and scale he brings to analysis of corpora of scientific texts…. [His work] will now be the benchmark for historical studies of scientific texts, and…may persuade some corpus analysts to look more closely at the institutions and practices around contemporary texts." "…this volume represents a useful and diligently researched contribution to studies of historical change in scientific discourse." "Scientific Discourse in Sociohistorical Context is an elegant account of the rise of modern scientific prose style from its origins in the mid-seventeenth century. Using the Royal Society of London's Philosophical Transactions as his basis, Dwight Atkinson presents a new and surprising history of science communication. He places the emerging style of the scientific paper in its successive historical contexts, and tracks its path to the dominance it enjoys today. The result is a theoretically acute interpretation of scientists' discourse--one that does not shrink from engagement with questions of scientific knowledge itself. Both students of science and practitioners of linguistics will benefit from this book." 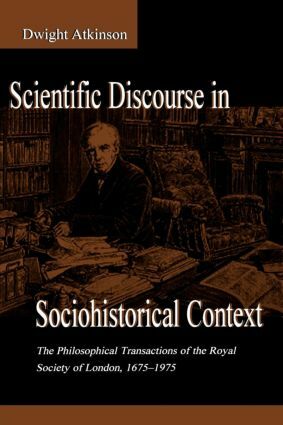 "Dwight Atkinson, in his book Scientific Discourse in Sociohistorical Context, undertakes an extremely ambitious project: an attempt to integrate quantitative/linguistic, rhetorical, and historical analyses of the Philosophical Transactions of the Royal Society of London, 1675-1975 into a single, coherent account. By all criteria, Atkinson has been fully successful in this endeavor. This book provides detailed descriptions of the history of the Royal Society itself; changes in the rhetorical structure and contexts of PTRS texts; and changes in the salient linguistic characteristics of texts across historical periods. Then, in the concluding chapters, Atkinson integrates these three perspectives, providing us with the most complete account of a scientific journal to date. At the same time, Atkinson provides us with a convincing illustration of how complementary research methodologies can be synthesized to investigate the complex ways in which linguistic, rhetorical, and historical factors are intertwined in the historical evolution of scientific discourse." Contents: Editor's Introduction. Introduction. Conceptual Framework. The Royal Society and Its Philosophical Transactions: A Brief Institutional History. Methods of Analysis and Description of Text Corpus. Rhetorical Analysis. Multidimensional Analysis. Synthesis and Discussion: Scientific Discourse and Scientific Forms of Life. Implications and Conclusions. Appendices: Contents of "Corpus B." Ranges of Variation for Overall MD Analysis. Standard Deviations for Overall MD Analysis.